Another quick meal, that only took mins to prepare, but filled with awesome satisfying flavours. The Baby Dill in the mixture adds a nice flavourful kick and blends well with the dish. 2. Combine all ingredients (not mini peppers) in a bowl. You can keep beans whole or mash with fork. Seasoned with additional spices as you desire. 3. 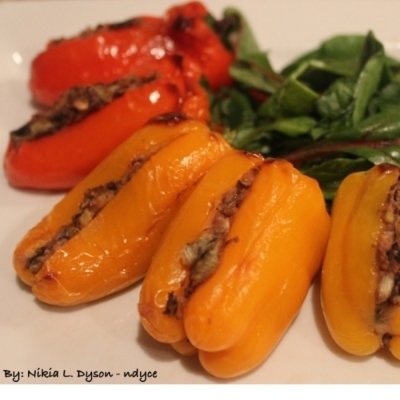 Gently slice each pepper (see picture in recipe), be careful not to split peppers in half. 4. Fill each pepper with mixture. If you have a hard time filling peppers, gently squeeze (Top & bottom at the same time-See picture in recipe for tip)..this will open the pepper. 5. Place in oven for 10-12 minutes.